Special occasions call for special gifts. A wedding is one of the most special celebrations of one’s life. It certainly demands a good selection of gifts. While on one hand, a wedding invite brings a lot of excitement, cheer, and happiness but soon it turns into anxiety as soon as the thought of gifting strikes. The thought of gifting something unique as well as functional becomes a hassled process. But, kitchen essentials, tools, and gadgets have become one of the safest and go-to-gifting options these days. Having the right kitchen tools and gadgets in the kitchen makes life easier for both husband and wife, post-wedding. Life in a kitchen has to be mess-free and well organized. With immense evolution, science and technology have joined hands and given us numerous kitchen tools and gadgets which have made life in the kitchen simpler and hassle-free. This, in turn, qualifies to be ideal wedding gifts. These gifting options will be cherished by everyone who spends a lucrative time in the kitchen and enjoys cooking. One of the essential items required in the kitchen is having an assortment of serving pots of dishes in a variety of shapes and sizes. Crafted of stainless steel, these stunning serving bowls with lid make a highly functional yet beautiful gift for a newly wedded couple who are all set to give a fresh start to their new life. F&S offers a brilliant selection of kitchen essentials like dessert sets, barware and more to choose from. If you’ve aced the art of cooking, you must be well aware of the variety of ladles, skimmers, and turners that are used to make cooking a cake walk! These days one may find different types of ladles and skimmers available in the market on the basis of the utensil you will be using. If you’re cooking in a non-stitch vessel, you may opt for a turner or ladle with a nylon coating. But, undoubtedly in India, stainless steel still rules the market. A kitchen without stainless steel kitchen tools like ladles, turner, and skimmer is like a book without its classic fragrance of pages. A gift set comprising of different types of ladles and skimmers will be cherished by a new bride. Owning an exquisite set of cutlery set certainly makes you a brilliant host. While some guests may go green with envy, while others will not stop praising you. Many never tend to pay any attention to spending on a good assortment of cutlery. This makes cutlery set as one of the most premium options for wedding gifts. 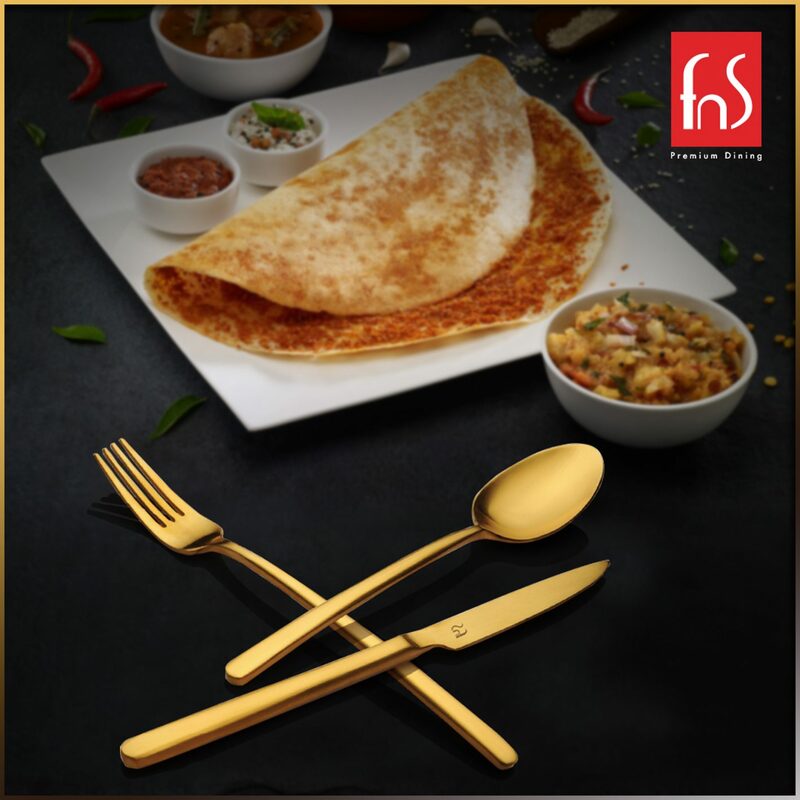 F&S offers a myriad selection of spoon and fork designs. Apart from these the brand also stocks an interesting array of tableware like decorative bowls for serving dry food items and barware essentials like decanters, cocktail shaker, wine bottle holder and more which can be distributed as special corporate gifts and wedding gifts as well.